The European Football championship known as UEFA Euro 2016 or just Euro 2016 is taking place from June 10 to July 10 in 10 different cities in France. Chosen in 2010 as the host country, beating Italy and Turkey, some of the French cities have built new stadia while others have been updated. This year there are 24 teams competing, up from the previous 16. It’s the third time France hosts the tournament. They were chosen when the tournament was inaugurated in 1960 and also in the 1984 finals. The French won in 1984 and 2000. Whoever wins this year will compete in the 2017 FIFA Confederations Cup in Russia. Each team has its own home base. The English team is based at Chantilly just outside Paris at L’Auberge du Jeu de Paume. Chantilly is very near Paris and will suit the team; it has a great English shop where you can get items like Marmite (love it or hate it) and other British staples. 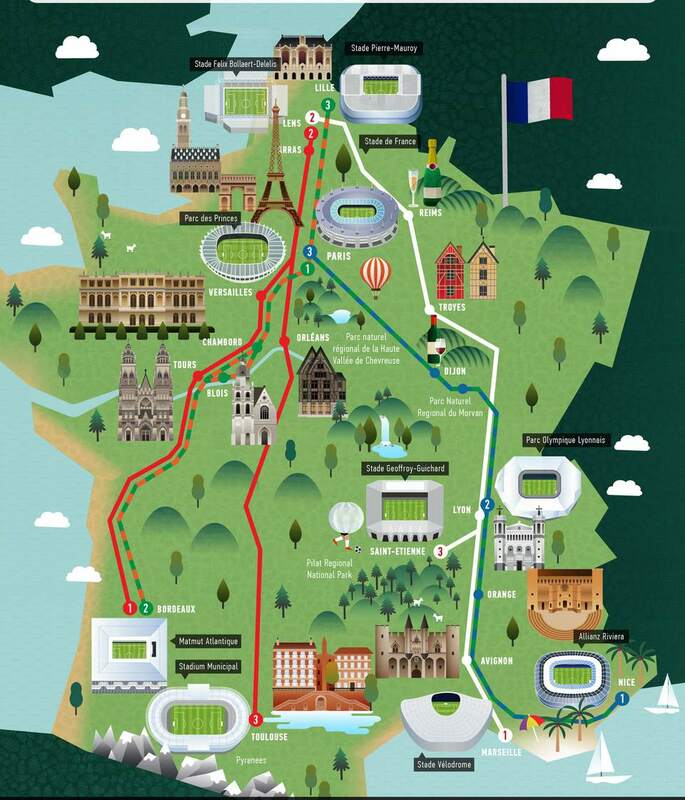 The Republic of Ireland team is based in Versailles, again just a hop, skip and a jump away from Paris. They are in the fabulous Trianon Palace Versailles. But whether this means that the two will be competing in the final remains to be seen! Read guest reviews, compare prices and book for the Trianon Palace Versailles on TripAdvisor. See the next page for details on the 6 groups of 4 teams and when and where they play. The rounds are done in 6 groups of 4 teams all of which play each other. If there’s a top team in a group with less successful teams, it seems a foregone conclusion (Germany are the current champions for instance). But some of the countries, like England, are playing young teams which adds excitement, and speculation. In the UK or Ireland and want more information? Check out this great supporters’ guide to the UK and Ireland teams which gives you details on all the group stage matches in France. If you're not sure where each stadium is, look at this guide which shows you the way. It also gives interesting places to visit along the journey there. Can't get tickets for the stadium games? Don't worry; use the guide for some of the great places to watch your team games in each of the host cities.